Here at Diabetes Flashpoints, we’ve discussed several potential risks and benefits of various zero-calorie sweeteners, as well as sugar, over the years. While questions about the safety of zero-calorie sweeteners — including invented ones like aspartame, saccharin, and sucralose, as well as plant-derived ones like stevia — often grab headlines, a recent study asked a different question: Do these products do what they’re intended to do? If you’re using them to try to lose weight or keep it off, the study suggests, the answer may be no. Published last week in the Canadian Medical Association Journal, the study looked at seven previously published clinical trials — in which people were randomly assigned to use a zero-calorie sweetener, or not to, for a period of time — as well as 30 observational studies, which looked at outcomes in people who did or didn’t use these sweeteners without trying to change anyone’s behavior. Randomized controlled trials are considered a better way to test the effects of any product or drug, since they remove the reasons why certain people might use the product in the first place from the equation. All together, the 37 studies the researchers looked at included over 400,000 participants, with about 1,000 taking part in randomized trials. As noted in an article on the study at Consumer Reports, the researchers found that based on just the seven clinical trials, there wasn’t any significant relationship between using zero-calorie sweeteners and weight-related measures like body-mass index (BMI), waist circumference, or weight lost over the course of the trial. In the 30 observational studies, though, it turned out that people who used zero-calorie sweeteners were more likely to gain weight and have a higher BMI and waist circumference. They were also more likely to experience conditions like high blood pressure and heart disease. While the observational studies tended to last much longer than the clinical trials and included far more participants, there are good reasons to be skeptical about zero-calorie sweeteners directly causing the outcomes associated with using them, since people who choose to use them may have different lifestyles, health histories, and cultural backgrounds from people who don’t. But even if the clinical trials are more reliable, there’s still no proof in this study that sweeteners help with weight loss, even if they don’t have any measurable negative health consequences. What role do zero-calorie sweeteners play in your life — do you use them? If so, are you motivated by weight concerns, blood glucose control, or something else? Would you keep using these products even if you didn’t believe they help you lose, or at least not gain, weight? Leave a comment below! 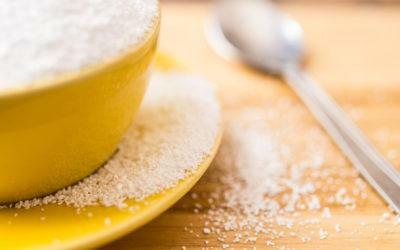 Want to learn more about artificial sweeteners? Read “Baking and Cooking With Sugar Substitutes” and our series on sugar substitutes by certified diabetes educator and registered dietitian Amy Campbell, covering aspartame, sucralose, acesulfame-K, monk fruit extract, stevia leaf extract, saccharin, and advantame.